In its most traditional sense, Upma is a common savoury breakfast dish made in many South Indian homes. It can be ruffled up in a jiffy, almost like a traditional fast food recipe! Upma is made from rava, a wheat derivative, or cream of wheat. Once cooked, it becomes soft and crumbly. 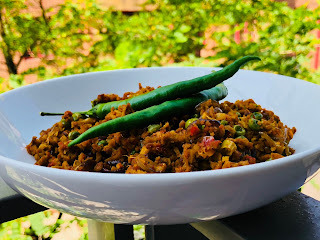 This is a generic upma recipe I make regularly at home, but you will find plenty of variations online. Just get comfortable with this one and then start experimenting. I love this recipe both hot and at room temperature and think it makes for a delicious lunchbox idea for kids. Heat a dry pan and add the semolina to it. Dry roast the semolina on medium flame for 5-6 minutes. Take off the fire and keep aside. Next heat oil in a pan. Add mustard seeds, green chillies, chana dal and the onions. Sauté for 3 minutes. Now add the ginger and curry leaves and continue sautéing for another 2-3 minutes till the onions turn pink. Drop in your frozen peas, 1 teaspoon of salt and stir for a minute. Add ½ a cup of water and bring to boil covered. Once the water starts boiling, slowly add the roasted semolina while stirring gently. 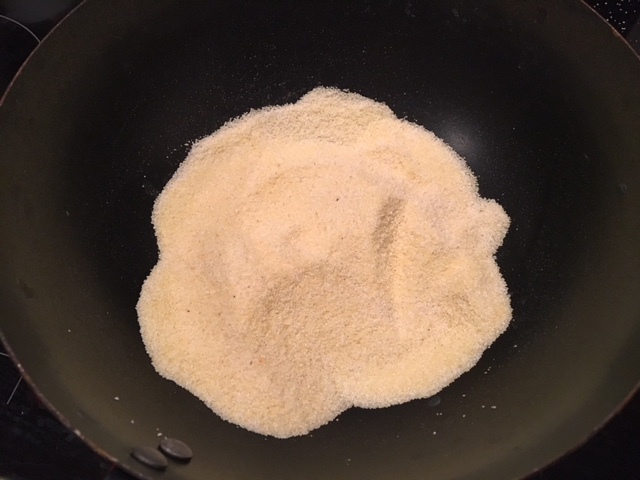 Semolina absorbs water rapidly and the mixture will start looking dry soon. Add about ¼ cup more water and cover the pan. Allow to cook on medium heat for about 3-4 minutes. Turn off the heat now, open the lid and squeeze in juice of half a lemon. Stir well. If you’re not vegan, then adding ghee instead of olive oil gives this dish an added touch. You can experiment by adding finely chopped carrots, beans, corn, roasted cashews or any of your favourite veggies to this dish. Semolina is also known as sooji, rava or cream of wheat. A number of brands such as Natco, 24 Mantra, Veena’s, Top-Op sell rava in the United Kingdom. It is easily available at any Indian store or an Amazon. Curry leaves are also typically found in Indian grocery stores. If you can't find them, don’t worry, just add chopped cilantro/coriander leaves at the end with the lemon juice.